At the beginning of October 1856 the following letter was delivered to Garton & Jarvis, and, has fortunately survived for over 150years. The Marine Stove you supplied for the barque “Cornucopia” answered admirably. In all my experience at sea (twenty three years) I have never seen any to equal it – the saving of fuel is considerable, which is of much importance on a long voyage. Your stoves only want to be known to be generally adopted. You will please forward another of 3 feet 8 inches length for a vessel of 460 Tons Register which will be launched on the 15th inst. With the able assistance of the Salcombe Maritime Museum and Mr Roger Barrett we are able to add quite a bit to this short letter. 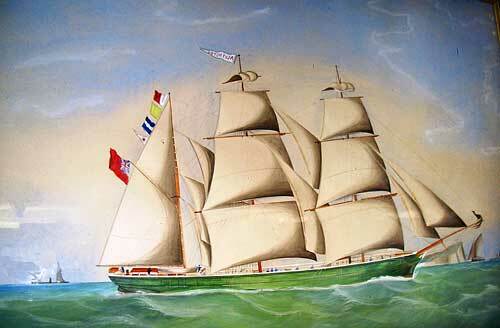 The Cornucopia was launched in 1848, 230 Tons Burden and built in Salcombe by Vivian of Salcombe. The first managing owner was Balkwill & Co and Peter Jarvis was the Master in 1848 and 1853-1856. In 1865 she was transferred to Arundel and registered in Littlehampton in 1866. Balkwill & Co were involved in the fruit trade so she frequently sailed to the Mediterranean, West Indies and South America. Peter Jarvis, listed as a Master Mariner, was named as one of the Shareholders of this ship together with four of the same shareholders that had an interest in the barque Cornucopia. Peter Jarvis was also Master of the Eclipse between 1857 and 1860. The Picture is of a very similar vessel to the Eclipse – this is the Alvington. A Model of the Eclipse made by the first ship’s carpenter, Mr Adams, can be seen at the Overbecks Museum, Salcombe, Devon.